Increases the amount of Magicka and Stamina restored. Maintaining the channel increases the amount of Health restored. Meditate: Focus your body and mind into a meditative state, healing for [1320 / 1386 / 1452 / 1518] Health and restoring [1320 / 1386 / 1452 / 1518] Magicka and Stamina every 1 second. You will remain in a meditative state until you toggle this ability off or are interrupted. Deep Thoughts: Focus your body and mind into a meditative state, healing for 1518 Health and restoring [1716 / 1782 / 1848 / 1914] Magicka and Stamina every 1 second. You will remain in a meditative state until you toggle this ability off or are interrupted. 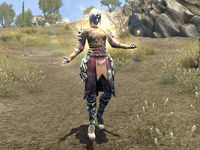 Introspection: Focus your body and mind into a meditative state, healing for [1518 / 1584 / 1650 / 1716] Health and restoring 1518 Magicka and Stamina every 1 second. Maintaining the channel increases the Health restored by 10% every tick, up to a maximum of 50%. You will remain in a meditative state until you toggle this ability off or are interrupted. Meditate causes you to enter a meditative state, restoring Health, Magicka and Stamina over time. You can remain in this state indefinitely until interrupted, or cast again to end the effect. Note that you cannot move, attack, block, or use any other skills while in this state. Introspection will restore more Health the longer you stay in meditative state, while Deep Thoughts will increase the rate of Magicka and Stamina Recovery. This page was last modified on 26 August 2018, at 03:42.